One of the most significant innovations in sixteenth century woodwind instrument building was the development of the double bore principle. Two parallel holes drilled in the same piece of wood and connected at one end by a U-curve allowed aninstrument to sound twice as low for its apparentlength as one with a single bore. Little is known about where the earliest development took place, although some evidence points to Italy. The name dulcian (also dulzian, dulzian, dolzone, delzan, dulcan, dolcan) is from the Latin dulcis (sweet). 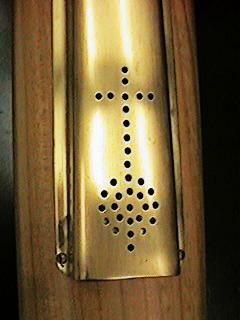 This instrument was also called the curtal (or curtoll, curtail) from the Latin curtus(short). By the end of the sixteenth century the dulcian had become a part of the town band. The bass shawm was did not last because it was too cumbersome and heavy. 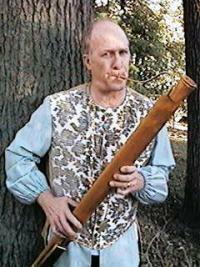 The dulcian could be used not only as an outdoor band instrument, but also in church to double the bass line on motets and masses, and in the courtly chamber for more intimate secular music. To counteract the bottom-heavy sound created by its conical bore, and to allow it to play with softer instruments, a perforated mute or bell cap, looking much like a pepper shaker, may be inserted in the open end. According to Praetorius, this makes the tone considerably softer and more beautiful. 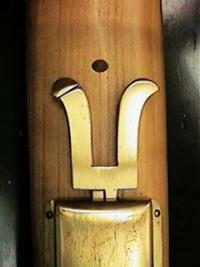 The dulcian was made in several sizes and has a range of about two and one-half octaves (C to g1). As the name indicates, the tone has a dolce quality when compared to the shawm. The bass size was the one which lasted as the forerunner of the bassoon. Musica Antiqua's collection includes a cherrywood bass dulcian in C by Gunther Koerber of Germany and a Moeck bass dulcian.